This week's issue of "Entertainment Weekly" features "The 122 People & Things we Love This Summer - The Must List." Included on this list at number 13 is Ralph Fiennes, who will be portraying Lord Voldemort in "Harry Potter and the Goblet of Fire" in November and "Harry Potter" illustrator Mary GrandPré at number 69. 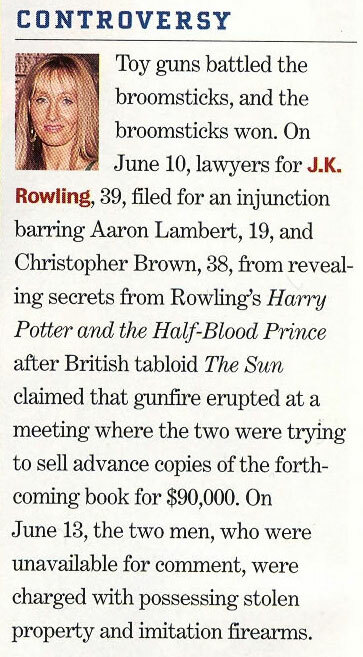 The magazine also has a small tidbit on the selling of "Harry Potter and the Half-Blood Prince." Mr. Fiennes had this to say on playing Voldemort: "My inclination was to underplay it, but you can't underplay Voldemort."